Hedges: Bossier Parish teams off to great start; will success continue in Week 2? Bossier Parish high school football teams couldn’t have gotten off to a much better start to the season. Five of six parish teams won — and the only one that didn’t lost to another parish team. Airline knocked off Class 3A preseason No. 4 Union Parish 21-0, Haughton downed Plain Dealing 42-16, Parkway rallied past Bastrop 57-56, Benton came back late to defeat Green Oaks 41-30 and Bossier defeated Homer 30-15. Bossier’s victory ended a 15-game losing streak dating back to the 2013 season. The Bearkats lingered on the field after the game accepting congratulations from students, alumni and other fans. Concilio said he got several texts from local rival coaches congratulating him on the victory. It just goes to show that there is a deep respect among coaches in this area. Bossier got solid play from junior Keimun Daniels on both sides of the ball. Concilio said he ran the offense well and also made some big stops from his defensive end position. Bossier has another good opportunity to get a win this week. The Bearkats host General Trass (formerly Lake Providence), a Class 2A school. None of the five other parish teams will be underdogs. Airline will have the numbers advantage when it hosts Green Oaks, just as Benton did. Airline’s Shun’Cee Thomas got his season off right with 170 yards and three touchdowns in the victory over Union Parish. The Vikings piled up 324 yards on the ground. Green Oaks does have one of the area’s top athletes in quarterback Jaylon Carey, who passed for 269 yards against Benton. He is also a dangerous runner. 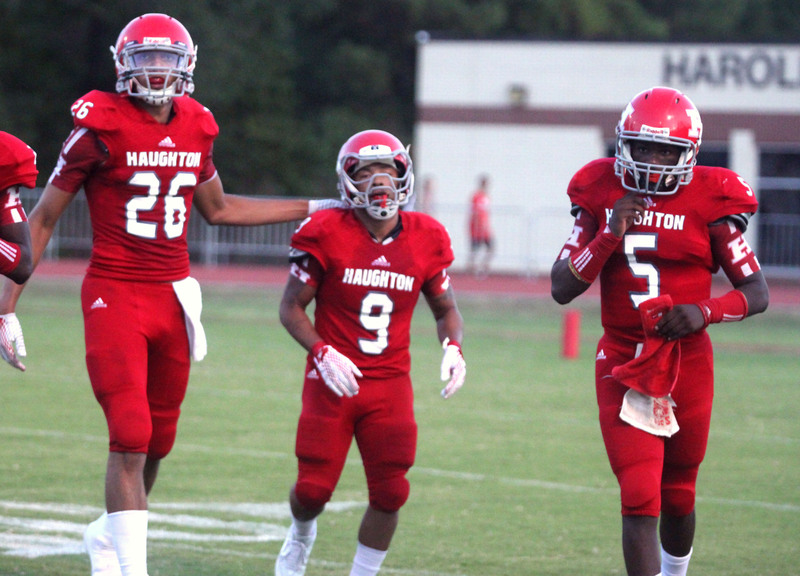 Perhaps the most intriguing game in Week 2 is the Haughton-Minden matchup. The Bucs dominated last year, but Minden went on to share the District 1-4A championship with Benton and North DeSoto. The Tide have a slew of players returning from that team and will have the home-field advantage. Haughton coach Rodney Guin didn’t get to see his first-team in action much as the Bucs rolled to a 35-8 first-quarter lead against Class 1A Plain Dealing. Guin came away impressed with the Lions, who were outnumbered about four to one. James Thurman, a former Haughton player making his debut as Plain Dealing’s head coach, agreed. Plain Dealing actually took a brief lead, driving 80 yards for a touchdown and scoring a two-point conversion. Keldrick Carper showed why he’s one of the top recruits in the Class of 2017, catching a couple of passes on the drive, including the TD. He also caught a conversion. The Lions should get their first victory of the season against a Lakeside team that was routed by Ringgold in its opener. Parkway pulled out a dramatic victory over Bastrop when CJ Morgan caught a pass from Keondre Wudtee and stretched the ball over the goalline with 6 ticks left on the clock. Wudtee, running back Robert McKnight and sophomore wideout Terrace Marshall all had big games for the Panthers. The defense gave up a lot of points, but it came up with a big stop on the two-point conversion after Bastrop’s final TD, giving the Panthers the chance to pull out the victory. Parkway trailed by nine at the half and 15 in the third quarter. The Panthers may have the toughest opponent of any of the parish schools this week. Parkway faces Gladewater, Texas, in the annual Battle on the Border at Independence Stadium. Gladewater won 11 games last season. The Bears will be coming in off a loss to Pittsburg. They rallied from a 28-0 deficit to take a brief lead before falling 49-36. Gladewater gave up 426 yards passing. That could mean a big day for Wudtee and company. Benton started strong against Green Oaks, taking a quick 14-0 lead. But the Giants rallied and led 24-21 at the half. They stretched the lead to 30-21 in the third quarter before Benton got its second wind and came charging back to win. Quarterback Garrett Hable spread the ball around to his receivers, including Clayton Festavan, John Westmoreland and Sam Simmons. Running back Jermaine Newtow ran the ball well. Chauncey Taylor came up with big plays on both sides of the ball. Four turnovers were a concern for Coach Reynolds Moore. He also was disappointed the Tigers couldn’t keep the great start going. Needless to say, he was pleased at how his team stayed in the game and fought back. The Tigers are facing a Natchitoches Central team that gave up 337 yards to North DeSoto’s option offense last week and generated less than 200 total. Still, it could be another close contest. But I’m going to go ahead and say parish teams will continue the hot start. In fact, I believe they will go 6-0.